"Meditate day and night on the Law of the Lord." Prayer is an intimate personal communion as we journey "toward God". Other aspects of our life include, indeed require, sisterly communion, thus bearing witness to our discipleship; labor as becomes the follower of Jesus, Who became poor for our sake; chastity, as enabling an undivided heart and making us available to the needs of everyone. 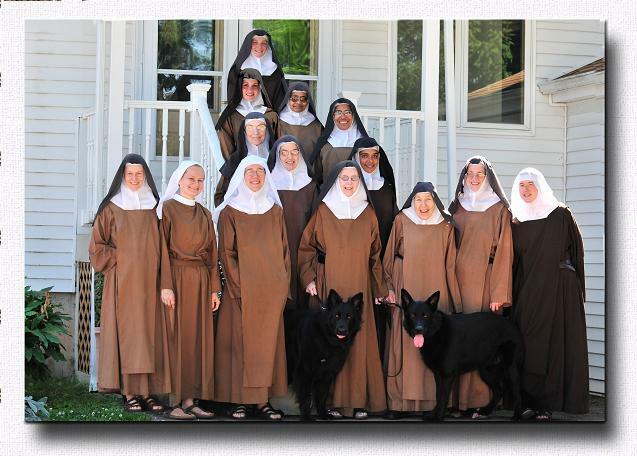 These are characteristics of a Carmelite community. 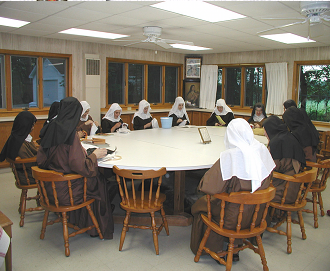 We are a "cloistered" community, according to the design of St. Teresa and present Church legislation. 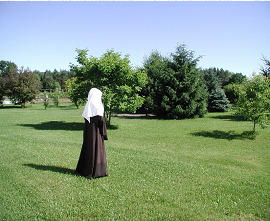 Time with God in private prayer is essential to Carmelite life. 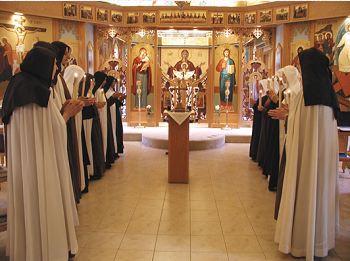 Liturgical prayer holds a very special place in our monastic day - for the Eastern Church (and we are a Byzantine Rite Carmel) identifies herself as "the Church who Worships". 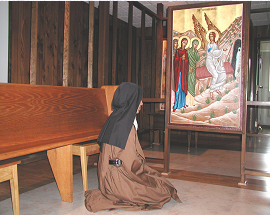 Six to seven hours daily are devoted to prayer and sacred Reading. We engage in various work- domestic chores, we operate a licensed bakery with mail order sales; art and printing, the breeding of miniature horses (Carmelite Mini Corral); we raise a good amount of our own food and there is the Monastery St. Nicholas' Gift Shop. Time with each other at recreation is also very important for it is in relationship that unselfish love is tested. The spirituality of Carmel is surely Gospel spirituality. Saint Teresa of Avila, our Mother and Foundress, identified her first community (San Jose in Avila) as the little "College of Christ". As a Contemplative Order" we exercise no active apostolate. Ours is a service of prayer. Jesus Christ Himself is our Model, and in the Gospel, especially of St. John, we see Him at prayer with His Father. From this relationship all His activity flowed, that is"to do always the Will" of the Father. Like most Carmels, we rely heavily on the support of the faithful but we also engage endeavors for self-support. At Holy Annunciation we operate a Bakery, the Carmelite Kitchen, with a Christmas -New Year "mail-order season". We grow as much of our own food as possible and "put up" hundreds of pounds of garden produce annually. Each year our gift shop is becoming increasingly popular - offering imported icons, candles made by the Sisters and an ever growing assortment of cards, designed and printed by the Sisters. Catalogs are available and the Community's newsletter, Myrrhbearing, is also offered on request.